It is hard to distinguish between the six big players on the Munich beer market. As you can see, they even have a marketing cooperation. Identical Maß, identical contents. I find it more interesting to blog about the small breweries. The ones who don’t have global distribution or have their own tents during the Oktoberfest. I may be snobbish. 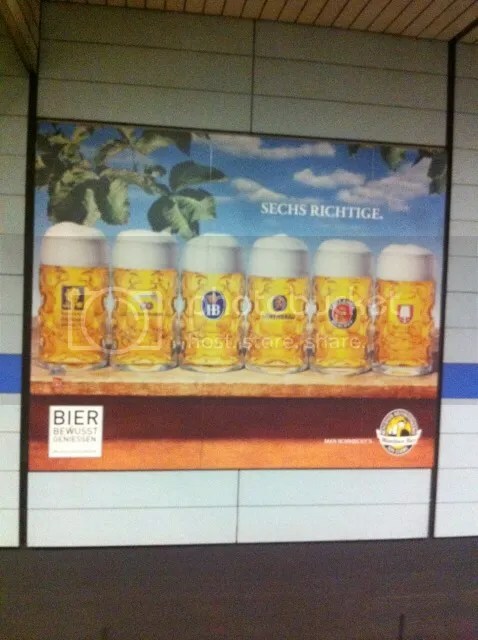 But I absolutely see the point in drinking a mass of Hofbräu, Augustiner or Löwenbräu in good company in one of the beer gardens of central Munich. But the marketing departments of the city of Munich and the breweries themselves makes sure that this information is easy to come by. So relax. Have a Bretzel. Have a beer. It’s not as if it’s hard to find. Think Augustiner is a great brewery. Great weissbier. Even better helles. And the Edelstoff is also very good. Wouldn’t mind if they HAD global distribution. And most of he other of the big six has at least a couple of really great beers (never liked Spaten very much though).